Sit in a time machine. 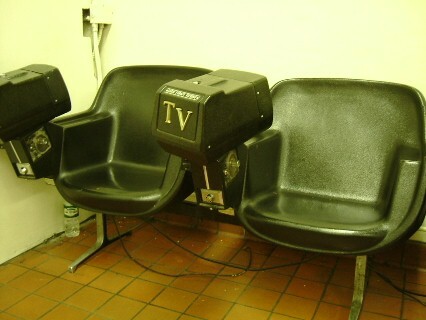 TV chairs at Seattle Greyhound station. A "throwback" to at least the 1970s. Back then, it seemed pathetic that folks were so addicted to TV that they would drop the quarters in; like folks dashing off the bus to catch a smoke during pit stops when "smoking in the last 4 seats" was outlawed. Today, these chairs are nostalgic. Still in use during a time of flat screen DVD players on stair masters. 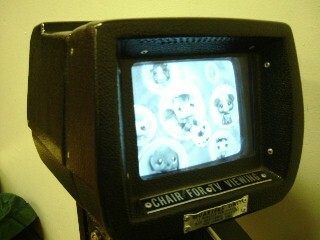 Click dials, black and white TV, only the channels one gets with rabbit ears. Should this environment be preserved as some heritage site? Seattle Greyhound has not yet been supplanted by some mega transit high tech super hub. Sit in TV chair, if picture is a bit fuzzy, gaze across drab lobby to Pete's Diner. Loved your commentary about Greyhound stationary TV´s. Internet terminals have replaced them to a certain extent. More recently I've noticed the TV chairs are gone.